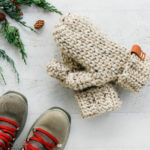 This free crochet mitten pattern uses cozy wool and a knit-looking stitch to create a timeless mitten style that’s great for personalizing and gift giving. Get the full free pattern below or purchase the ad-free, printable PDF for $2.75 here. Thanks to my friends at Lion Brand yarn for sponsoring this free crochet mittens pattern and enabling more free patterns on Make & Do Crew! This post contains affiliate links. UPDATE: After you learn how to make this free crochet mitten pattern, check out my video tutorial on using food coloring to dip dye them here. It’s magical! SECOND UPDATE: I’ve create a video tutorial with simple tips on working the Knit (Waistcoat) stitch used in this mitten pattern. You can find that tutorial here. Did anyone else grow up wearing knit wool mittens? 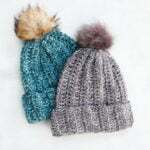 My mom would make my sisters and me each a pair (usually out of much finer yarn that I’m often willing to deal with ;)) and tie them together with a braid that would hold them securely in our coat sleeves all winter. Even as a kid, I knew that something handmade held a pretty special value. It was this memory of classic wool mittens that I had in mind when when designing this free crochet mitten pattern. 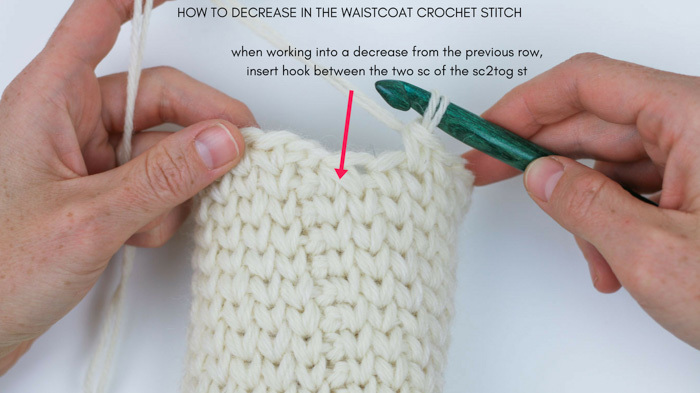 And while I’ve seen a lot of people using the Waistcoat crochet stitch lately to achieve a knit-look with crochet, I’ve n…e…v…e…r been able to get it to work for me before. It’s always been too tight and wonky-looking and I’ve given up on at least four occasions this year. This time, I was determined to make it work because I knew it was pretty much the only way I could make “knit” mittens with crochet. 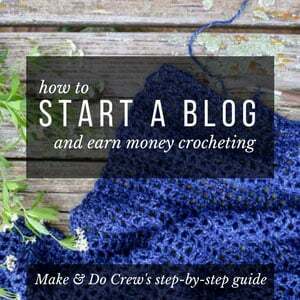 – You have to crochet loosely. Like seriously loosely. I sized up my hook like three times before finding the right gauge. Sweet Everly B has some really cute crochet patterns using the waistcoat stitch that you should check out if you like crochet that looks like knitting. And while I was adding my free crochet mitten pattern to Ravelry, I came across Carmen Jacob’s Photography Mittens, which are also made using the waistcoat stitch. What’s cool about her pattern is that it includes little slits for your thumb and index finger to sneak out of the mitten to operate a camera. Def check out the free pattern if, like me, you’re often taking photos outside in the dead of winter! Lion Brand Fisherman’s Wool proved to be the perfect fiber to whip up some knit-looking crochet mittens because as 100% wool, it’s super warm and cozy for cold winter days and it’s naturally water resistant. The wool fiber really conjures that classic mitten vibe and I’m guessing our great grandmothers might have been making similar mittens for their families a century ago. Fisherman’s Wool comes with a hefty 8 oz (465 yards) of yarn as well, so you’ll even have some yarn left over to start another pair. Wouldn’t these make perfect crochet stocking stuffers for friends and family? UPDATE: Lion Brand has created a kit that includes the yarn you’ll need to make these knit-looking mittens, plus a printed copy of the pattern. What a fun package to receive in the mail! Grab your Morning Mittens kit here. 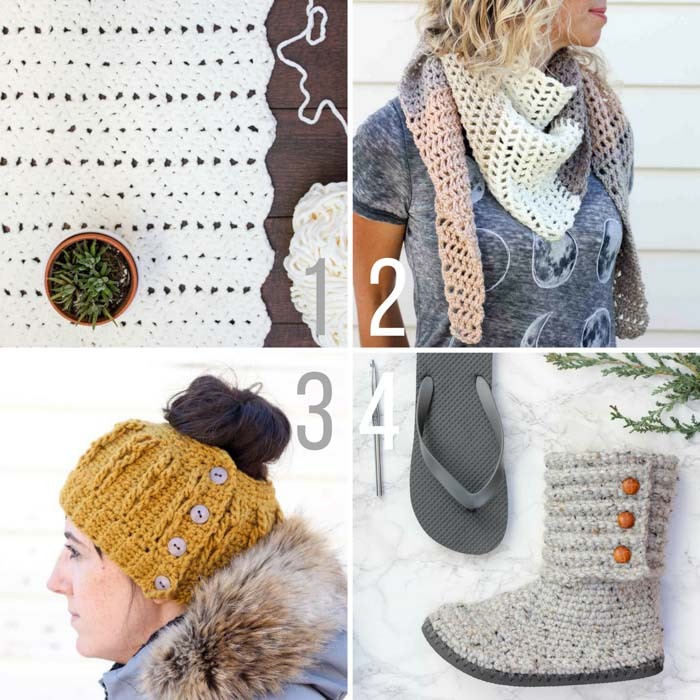 Speaking of handmade gifts, I’ve included a few other free Make & Do Crew crochet patterns below that would make great DIY presents for someone special in your life. 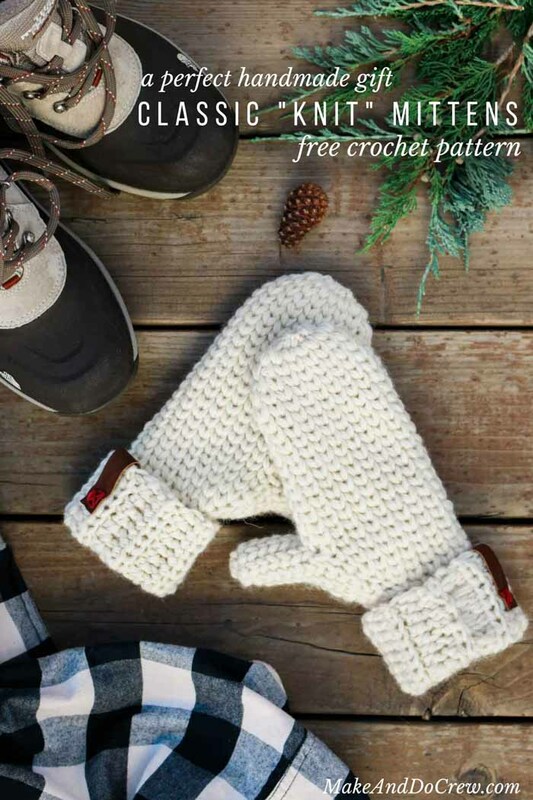 Scroll down for the Morning free crochet mittens pattern! Inspired by wool mittens of yesteryear, the Morning crochet mittens may look knit, but they’re actually crochet! The simple single crochet waistcoat crochet stitch creates a beautifully classic knit-like texture, while the 100% wool yarn means your mittens are also naturally water resistant. (Not a fan of wool? Substitute your favorite worsted weight alternative!) 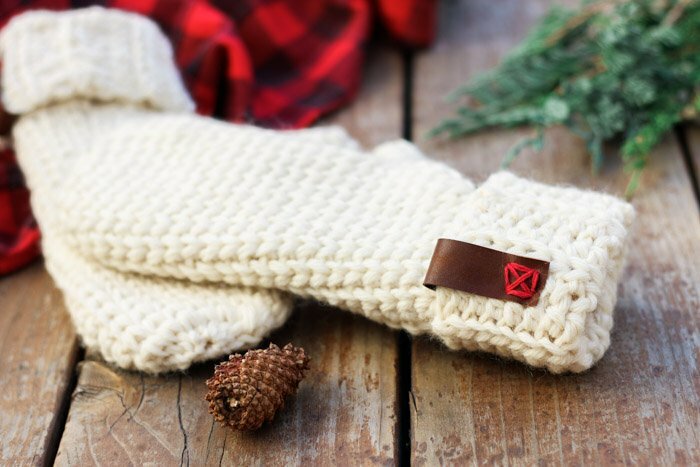 By holding two strands of yarn together, these mittens make for super speedy handmade gifts. Personalize with buttons, leather or even dye! So you can spend more time making mittens and less time shopping, this pattern contains affiliate links at no extra cost to you. Purchase a kit with the yarn needed, plus a printed copy of the pattern here. Pattern is identical for S and M/L. Sizing is based on hook size used. • The pattern is written for one size. 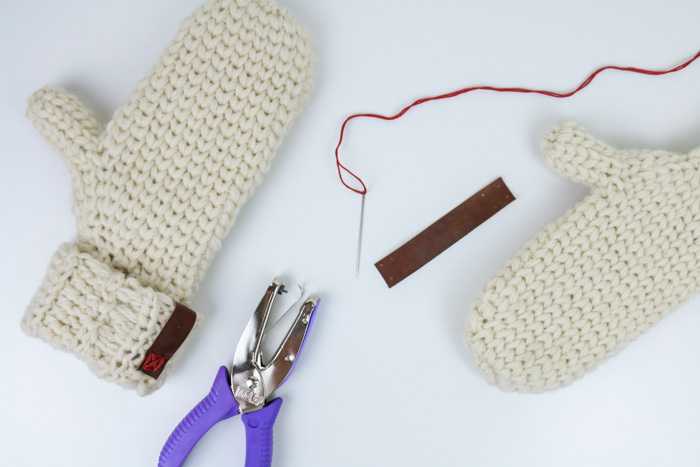 Follow notes within for appropriate hook size to make either S or M/L mittens. • Entire pattern is worked with two strands of yarn held together. Either work with outer strand and inner strand of skein or remove a “baby skein” from the inside of the larger skein and cut to create two separate balls. • Learn how to dye your completed crochet mittens with food coloring in this video tutorial. • Watch this video tutorial to learn essential tips on successfully working the waistcoat stitch used in this mitten pattern. Size small: Use size K hook. Size medium/large: Use size L hook. • Row 2 and beyond are worked into the middle of each sc stitch rather than the top loops. See photo below for hook placement. 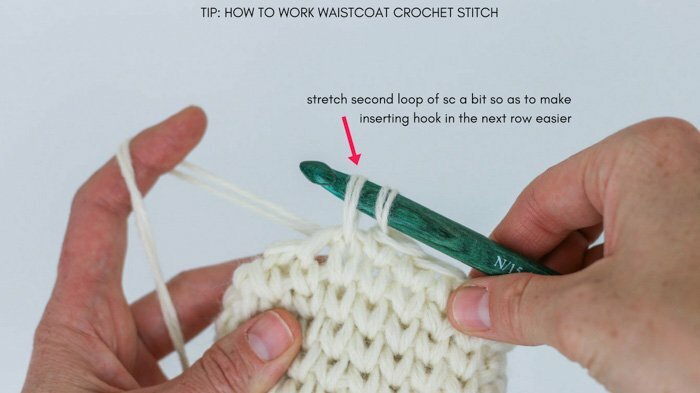 Besides inserting your hook in a slightly different location, you will still be working regular sc stitches. Size small: Use size L hook. Size medium/large: Use size N hook. Weave in any remaining ends now as it will become difficult to do so later. See photo below for where to work into decrease sts. Proceed to instructions for closing the top. See photo above for how to decrease (sc2tog) while working between posts of each sc stitch. 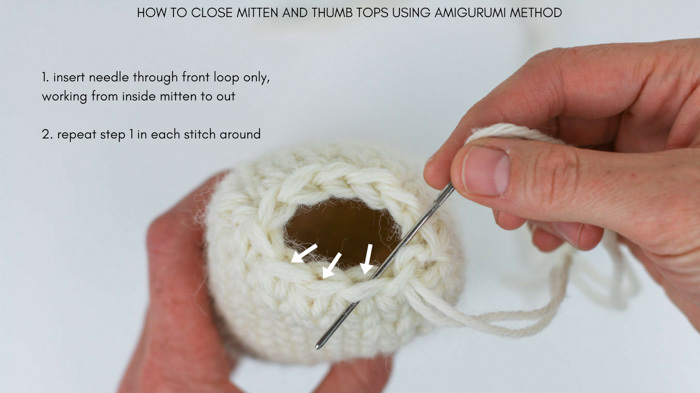 Mitten top is closed using a technique commonly used in amigurimi where tapestry needle is worked through only the front loops of each single crochet stitch. Thread both strands of tail from mitten top onto tapestry needle. Insert needle from inside of mitten, under front loop of first sc, out toward you. Repeat each each sc around taking care to always work from inside mitten to out. Do not tighten down as you go. 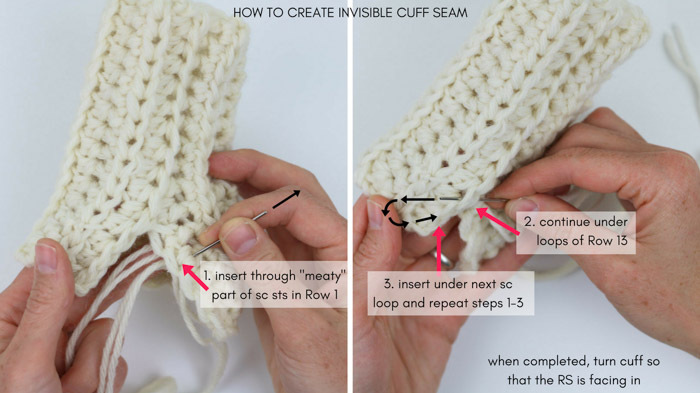 Once you return back to first sc stitch, gently cinch circle together until it closes. Use tapestry needle to weave in remaining tail. This is a helpful tutorial with more details on this technique. 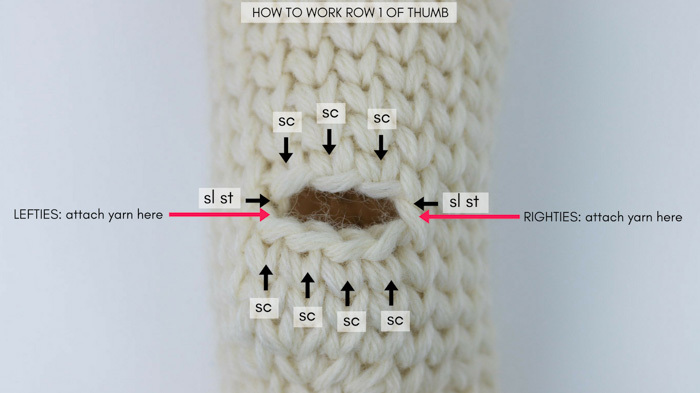 Right-handed crocheters: Attach yarn at right “corner” of thumb where Rounds 6 and 7 meet. Work clockwise. Left-handed crocheters: Attach yarn at left “corner” of thumb where Rounds 6 and 7 meet. Work counterclockwise. 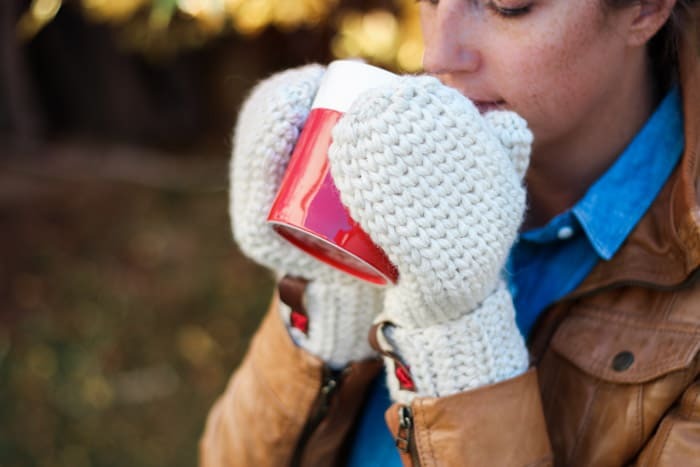 Brew some coffee, pull on your new Morning Mittens and head outside to catch the sunrise! Please Note: 100% wool yarn can shrink if washed incorrectly. Keep your new mitts from becoming minis by washing with cold water and laying flat to dry. You can learn how to dip dye your completed mittens with food coloring here! 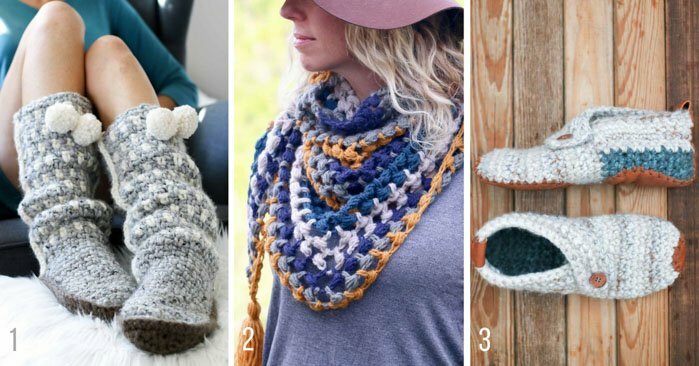 Here are some other free crochet patterns and tutorials from Make & Do Crew you might like to make next! 2. Desert Winds Triangle Scarf – one skein project! 3. 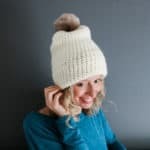 Faux Cabled Bun Beanie – free pattern and video tutorial! 4. Cabin Boots made with flip flop soles – free pattern and video tutorial! What an Awesome Pattern for mittens! 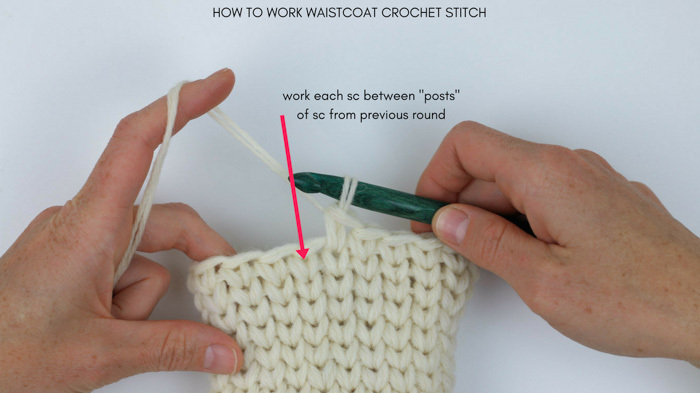 I can’t wait to try your neat way to create a crocheted “knit-look” stitch! Thank You So Much for sharing Your Inspiring Creativity! 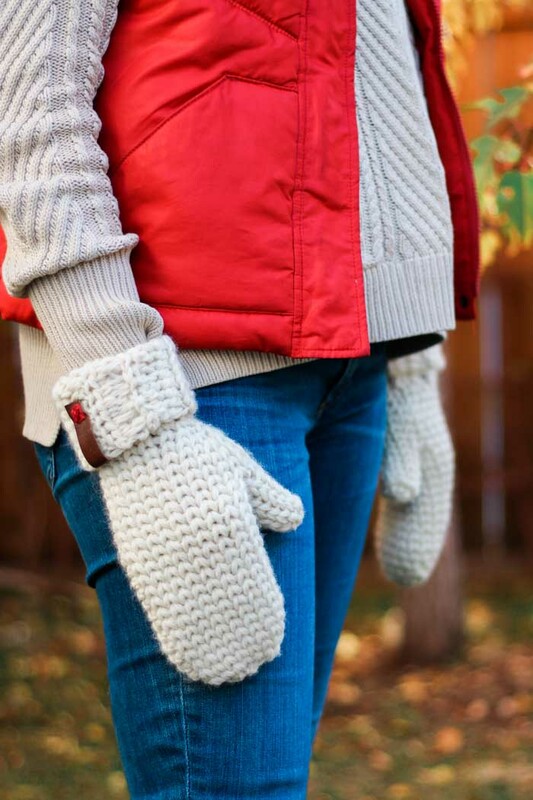 I have never had any interest in crocheting mittens–until now. Never wanted to figure out the thumb hole or how to sew to finish off, but your instructions are so clear that I think I’ll have to try this technique. Thank you so much for sharing the pattern. You asked for other ways to make crochet look like knitting. My favorite is Tunisian crochet. The Tunisian stitch named Tunisian knit stitch looks exactly like knitting. So much so that items have been disqualified from crochet contests because the judges thought they were knitted. I love Tunisian crochet and I can do anything, including cables, that knitters do, with my Tunisian hook. Scored a brand new golden brown XL leather jacket at Goodwill for 7.50! Perfect for soles and accents! Thank you for the idea! How would you size these up for a man? 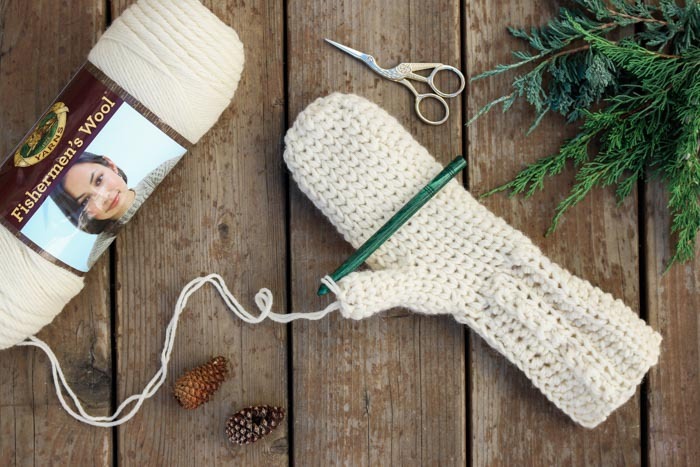 Would you use a bigger hook on the mitten part or add another row of increase for the thumb and another row for the mitten? b. add a couple rows to the cuff and then work an additional 2-3 stitches into the first round where you’re working into the cuff. You may find that you need to add an extra ch for the thumb hole too. Jess, this pattern is great! I’ve always been a little hesitant of crochet mittens, but these are perfect. The waistcoat stitch is nice and tight so you don’t have holes! Thanks for mentioning my tutorial too. Hi! When you say use two strands, is that only is you substitute the wool yarn for Lion Brand Vanna yarn? Or use two strands for this pattern regardless of yarn? as i was making these mittens i didn’t like the seam that was up the side of the mittens so i made them without the slip stitch and the ch 1. turned out amazing thank you so much for sharing your pattern. i will be making lots more of these. These mittens caught my eye immediately. You’ve created another amazing pattern. My first attempt at using the waistcoat stitch went well, but I think I made a few other errors. ~When you slipstitch to join the rounds, are you slipstitching into the first single crochet? ~Is the first single crochet made in the same space as the chain? Thank you for your help and the lovely pattern. I made them for my 5 year old daughter. I just used one strand of worsted weight yarn instead of 2 and a G hook. They turned out perfectly. Oh that’s awesome to know! Thank you for sharing those details. I have a 5-yr-old too and I’m sure she’d love a pair! Does the pattern or hook size change if you use a thicker yarn? I finished the right mitt and it’s HUGE and I even omitted ~7 rows. Help! Yes, it’ll def change if you use a thicker yarn. The gauge listed in the pattern assumes using two strands of worsted weight held together. If you’re not achieving the same gauge listed above then you mittens will be different than the measurements listed. This stitch is so pretty, its my favorite. But, I dont understand how to join in the round and keep it straight, mine goes in a slant. Can you please explain how to keep it straight? Thank you. Do you by any chance have a video for these mittens? I’m still fairly new to crocheting and have never figured out how to make a nice mitten. These are the nicest I’ve come across.